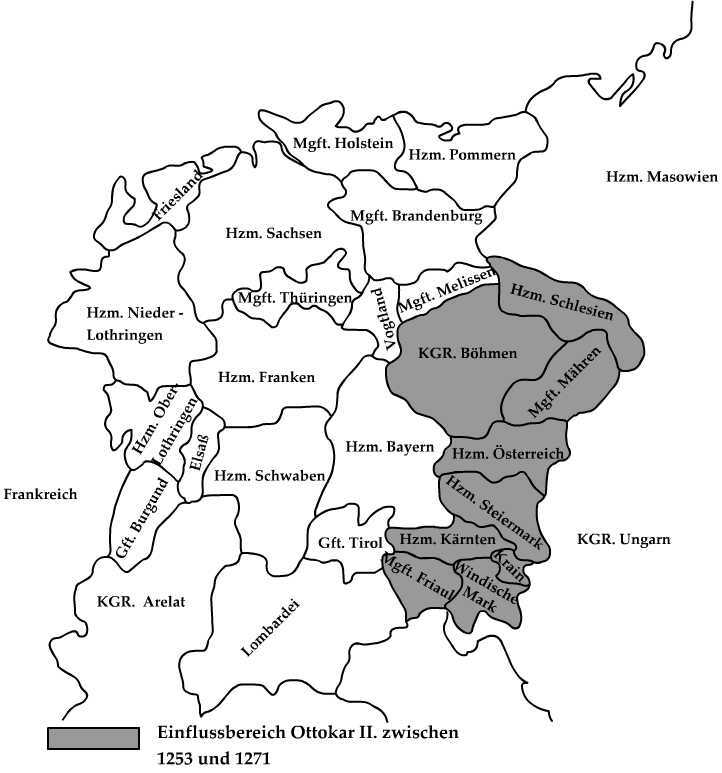 At the start of the 15th century, we find Austria with a similar division as Bavaria; an Upper and Lower Austria, each of two duchies. Unlike Bavaria, the Austrian domains were a result of political unification and a last will of a dying Duchess. During the war against Hungary, Ottokar II of Bohemia managed to unite Styria with Austria in 1261 and later added Carinthia and Carniola in 1269. 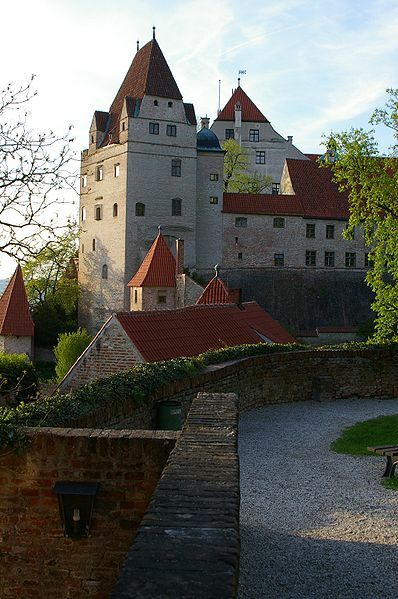 After his defeat by Rudolph I of Germany in 1278, the House of Hapsburg reigned until WWI. In the 14th and 15th century, lands in the vicinity were acquired, the most significant being Tyrol, bequeathed to Rudolph IV of Austria in 1363. Following the reign of Rudolph IV, the domains, under the Treaty of Neuberg 1379, were distributed between his brothers Albert III and Leopold III to what is known as Upper and Lower Austria. At the campaign opening, Austria has little interaction with Bavaria other than utilizing the water and land corridors en route to Switzerland. During Bavaria's internal squabbles, Austria can intermediate on their behalf. As the game progresses, Austria's attention will be directed to the political changes taking place in the east, the rise of the Ottomans. Terrain Type: Arable. Aggression: 2 Like Bavaria, the geography of Austria overlaps several types; Arable, Hilly and Forest. Months back, when I create a list of topics as background research for this campaign, I added Superstition. A player could always lay their misfortune as a result of a superstition overlooked, but other than black cats, witches and walking under ladders, my knowledge was very limited. This past weekend I painted 16 Wolves from Coppelstone Castings and like most painting projects where my knowledge is limited, I screen the Internet for ideas. Along with the required details for wolf pelts, hunting patterns and the like, nuggets of useful information regarding superstitions and fables were uncovered. "... in Roman mythology, the Capitoline Wolf nurses Romulus and Remus, the future founders of Rome. In the mythology of the Turks, Mongols and Ainu, wolves were believed to be the ancestors of their people, while the Dena’ina believed wolves were once men, and viewed them as brothers." "It appeared in the seventh century edition of the Physiologus, which infused pagan tales with the spirit of Christian moral and mystical teaching. The Physiologus portrays wolves as being able to strike men dumb on sight, and of having only one cervical vertebra. 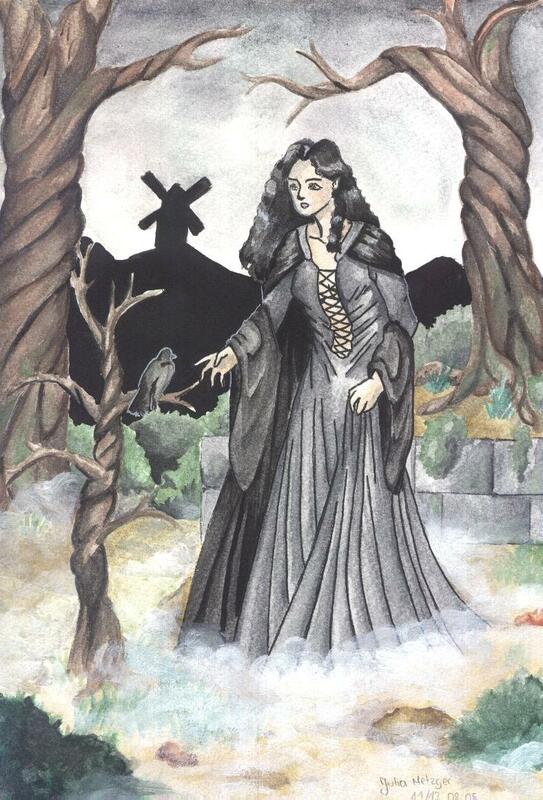 Dante included a she-wolf, representing greed and fraud, in the first canto of the Inferno." The Malleus Maleficarum, first published in 1487, states that wolves are either agents of God sent to punish the wicked, or agents of Satan, sent with God's blessing to test the faith of believers. 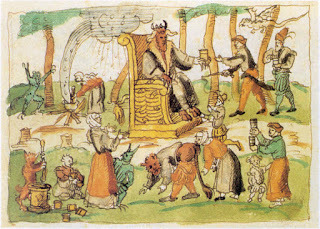 “Folk belief in reality of witchcraft had been denied by the church in earlier centuries; Charlemagne had specifically outlawed the old practice of witch burning "in the manner of the pagans" since witchcraft was originally viewed by many early medieval Christians as a pagan superstition. 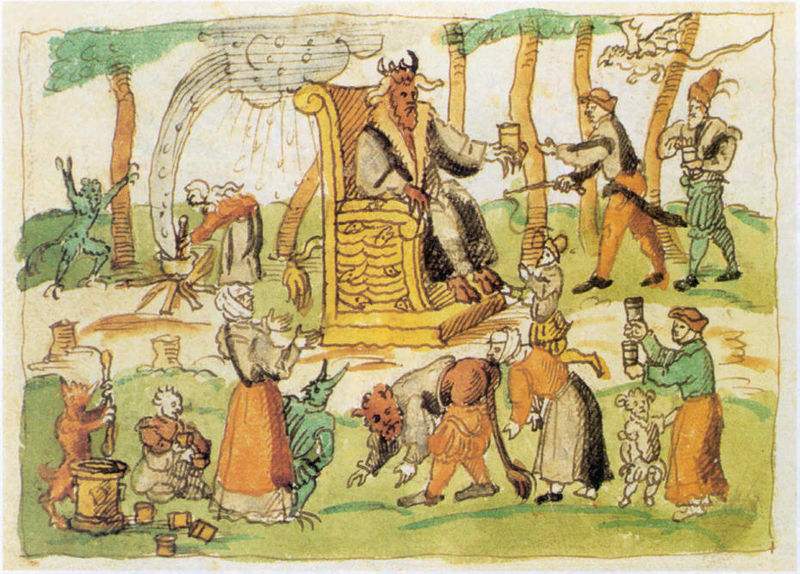 By the 15th century, belief in witches was once again openly accepted in European society, but they typically suffered penalties no more harsh than public penances such as a day in the stocks. Persecution of witches became more brutal following the publication of the Malleus, with witchcraft being accepted as a real and dangerous phenomenon." This is a tricky topic to bring to the game table without a medieval DBA game becoming a fantasy HOTT battle. The early WRG Ancient rule sets allowed for sacred items to lift a flagging morale; the Ark of the Covenant, the Raven banner, and the Oriflamme, to name a few. In one manner, the hesitancy, uncertainty or fear could result in a reduction of movement, such as would be brought on with a thick mist or no movement due to an eclipse of the sun as examples. After some thought, this item would have a better place at the strategic level. If an area were known to be inhabited by wolves, witches or other demons one would normally give the area a pass. Questionable areas can be marked on a map, that any player wishing to pass through would require an extra incentive (extra pip) to do so. You could view the + 1 requirement to cover the time necessary to find the local “priest/wizard or astrologer” who could bless, conjure or divine the propitious moment to move. The Swiss Confederation began as an alliance between communities with a common interest in free trade and the maintenance of peace along trade routes crossing her boundaries. 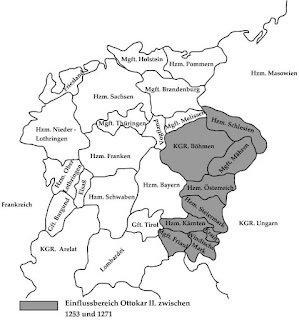 Granted reichsfrei status, the cantons of Uri, Schwyz and Unterwalden came under direct authority of the emperor. By the end of the 14th century, the cantons of Bern, Zurich and Lucerne became part of the confederation. An idyllic situation it was not, as the rise of the House of Habsburg meant the dissolution of reichsfrei status, thus bringing confederation into direct conflict with the Empire. Lasting from 1401 to 1429, this successful uprising was between the farmers and craftsmen of Appenzell and St. Gallen against the House of Habsburg and the Prince-Abbot of the Abbey of St. Gall. The Battle of Arbedo was fought on June 30, 1422 between the Duchy of Milan and the Swiss Confederation. 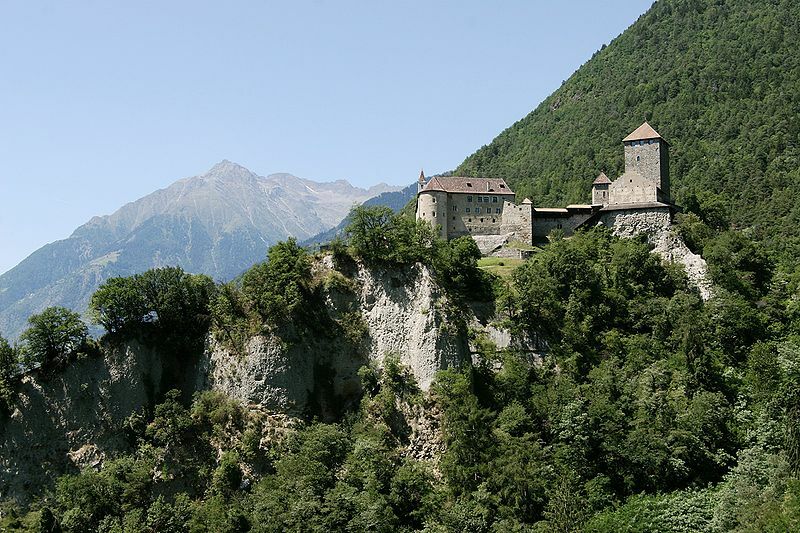 The victory secured Bellinzona and the Leventina to the Duchy. In addition the Duchy gained the Val d’Ossola, thus the Swiss losing all the territorial gains they had made. The defeat discouraged the Swiss expansionist intentions towards Lake Maggiore for a long time. 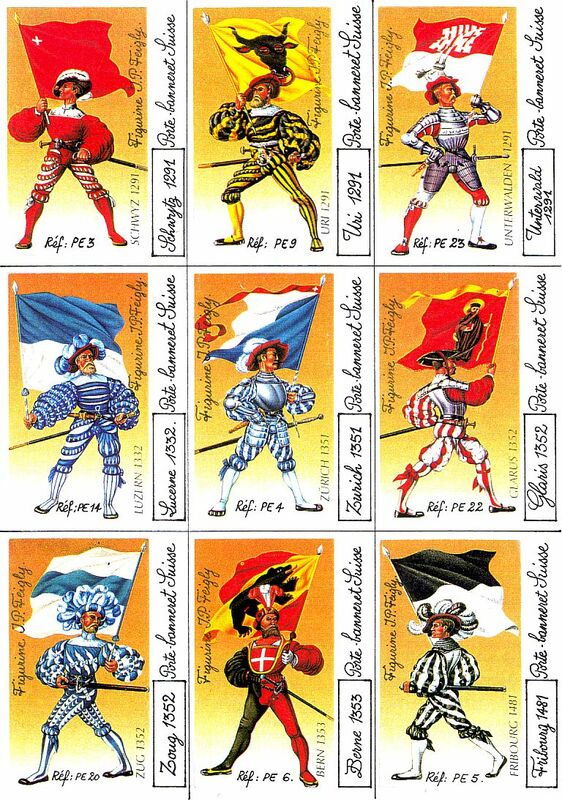 It was the defeat at Arbedo that made the Swiss increase the number of pikemen. Looking at the two army lists in the current DBA 2.2 book, our Swiss army falls in the transition period of weapons choice; from halberd to pike. As our campaign starts at the year 1400 AD, it would not seem unreasonable to field half pike, half halberd as the Battle of Arbedo proved a decisive point to increase the number of pike. With this in mind, the list is modified for our purpose. Illustration at top with thanks from Jiri Gajdorus (CH). The campaign, Storm Within the Empire opens at the start of the 15th century. Bavaria as we know it is split into minor duchies, each held by the sons and families of the then Emperor Louis. Game map 1 shows the four duchies are colour-coded. Further, München and Ingolstadt are known as Upper Bavaria, while Landshut and Straubing make up Lower Bavaria. This is important, as the division reflects different geography which in DBA terms are Arable, Hilly, and Forest. As the campaign extends further to Bavarian holdings in the Lowlands, the geography around Frisia and Seeland can be classed as “Littoral”. The below list are the residence (capital) and cities of each Duchy. If at first sight, some have a distinct advantage in size, historically, this fluctuated by further internal conflicts (family feuds) and alliances. - Garmisch, Partenkirchen, Innsbruck, Amberg, , Berchtesgaden, , Passau. and Imperial Cities = in bold type. All four duchies draw their forces from the same lists, IV/13b. As the campaign reaches the year 1440, option IV/13c can then be used until that time. Knights are not double based despite the references in the DBM(M) lists. The deployment of the wedge was not as widespread throughout the Empire and actually was a late 15th century ideal falling outside our campaign period.